But more citizens will be inclined to take the view, eagerly expressed by Opposition Leader Basdeo Panday, that the State airline’s retreat was a “victory for the people”, meaning those who made known their opposition to what was seen to be another example of the spendthrift ways of a revenue-rich administration whose leader, rather than set an example of fiscal restraint to the nation, was seen to be encouraging its traditional spendthrift ways fuelled, as he continues to be, by the grandiose delusions that often afflict prime ministers and presidents of so-called developing nations. THE BID by the Prime Minister Patrick Manning-led Government to acquire an executive jet yesterday crash landed as Caribbean Airlines (CA) announced that it will not go forward with a proposed multi-million dollar luxury jet acquisition with Bombardier. But there was no sign yesterday that this will be the last Trinidad and Tobago will hear of a jet for the Government as Marianno Browne, the Minister in the Ministry of Finance, and CA defended the faltered deal’s viability and signalled the possibility that if another jet becomes available the Government will support CA in its plans to offer an executive jet service. “CA…will not be proceeding with the purchase of an executive jet at the present time,” read a release faxed to the media yesterday afternoon. However, CA—as company chairman Arthur Lok Jack did last week—made it clear it will continue to explore opportunities to establish the executive jet service. A six-paragraph press release from CA yesterday confirmed the permanent grounding of the US$65 million deal to acquire a luxury Global XRS ultra-long range jet from the Canadian firm of Bombardier . The main clients for the service were to have been Government Ministers, including the Prime Minister, plus corporate clients and regional leaders. Both Government—which supported the investment with Cabinet approval three weeks ago—and CA have suffered severe flak from various quarters concerning the idea. Yesterday, Works and Transport Minister Colm Imbert confirmed talks between CA and Bombardier failed to lift off from the negotiating table and were eventually “downed” by the anti-corruption clause which Government wanted in the agreement. The public must take credit for forcing the government and Caribbean Airlines to abort the “obscene plan to purchase an executive jet” for the use of the Prime Minister and his Cabinet, Opposition Leader Basdeo Panday said yesterday. Panday said the public needed to know the specific details of the anti-corruption clause that CAL and Bombardier could not agree to. The TT$400 million Bombardier jet deal is dead. The executive jet idea is, however, still alive and will return in a different form, probably involving a leasing arrangement. Opposition Senator Wade Mark says now that Caribbean Airlines Ltd’s (CAL) attempted private jet deal has crash landed, the United National Congress Alliance’s (UNC-A) investigation into the matter has only now begun. Opposition Senator Wade Mark says Caribbean Airlines Ltd chairman, Arthur Lok Jack, should be fired for saying that if the money for the carrier’s now failed jet acquisition were returned, this would not mean the immediate acquisition of more hospital beds. Speaking on TV6 this morning, CEO of Caribbean Airlines Philip Saunders and Chairman of Caribbean Airlines Arthur Loc Jack again stated that the jet deal fell through because Bombardier could not agree with the anti-corruption clause. Andy Johnson, the host of the program on TV6, asked Saunders if they attempted to insert an anti-corruption clause in the deal after the initial public outcry, to which he responded that the anti-corruption clause is a good business practice so they proceeded with it. Andy asked the question again but the answer remained the same. TV6 reported that a high ranking government official said that they insisted on the anti-corruption clause after they got wind that a high commission was to be paid to a local agent. Of course, we are not getting any more details on this latest attempt at a spin. I do not believe them. As I stated in a previous comment, the government made a down-payment on that plane without an anti-corruption clause so I am of the view that this clause was a red herring. The government is dishonestly bent on trying to make it appear that they did not cave in to public pressure. This whole affair was quite obnoxious and even people who usually support the PNM at every turn could not defend this deal. If the government could have sold the jet idea to the majority of their diehard supporters alone, they would not have caved in. It is pretty clear that the government felt the weight of widespread public condemnation. More alarming is that even in the face of defeat they are stubbornly and arrogantly stating that they intend to pursue another jet deal, apparently without addressing the many public concerns. This government should not get a consolation prize for their arrogance, dishonesty, lack of transparency and prodigious squandering of our resources. The public should continue to be vigilant and demonstrate concern over the lack of transparency surrounding all projects in the country, especially the Rapid Rail project. I fail to see what the big deal is about, why can’t the prime minister have a private jet for himself & visiting heads of states. Every little celebrity & rapper travels by private jet, if I was the leader of one of the riches islands in the C’bean I would already own my private plane. p.s. THE CAPTION ON THIS STORY IS VERY IRRESPONSIBLE, THE EDITOR SHOULD BE ASHAMED, words & images are very powerful, this is yellow journalism at its worst! We have a terrible perceptual problem here, how the Government does things and how the public reacts to them. It is NOT just the jet, it is the blimp, the radar systems, the patrol boats, the seeing cameras and other seemingly important purchases which on the surface appears good for public protection and public good but when put into action everything falls apart. It is common practice in the Americas that when a huge purchase/sale is made the facilitators are awarded handsome dividends. The idea of an anti-corruption clause may be good public relations but in reality is unimportant in these scenarios, costs cab be padded, the average consumer in the US gets a telephone bill or cable bill that are padded. Government’s failures on these acquisitions are NOT the purchases but what they do after the purchases. Negotiations appear to deal maily with purchases that do not go beyond the transfer of money. The operationsd of these high-priced items are just as important as the purchase but everything goes dead after that. They must re-think how they do business. Building a case for the purchase and operating and maintaining are just as important as the purchase. This, my friends, is what I’ve been talking about for a long time! A truly textbook response to these bone-heads who don’t realize that they have been hired by the people to tend to the people’s business. Now…on to crime and food prices and…well every other damned thing they’re supposed to be spending their time (and your money)looking after for you! Again as I said the issue of the purchase of a jet for the governments use was a set up to throw the opposition of track as to the issue of crime and it worked perfect so now that they have buy them self some time and get the heat of their bock now it is back to business thet is what make politic so interesting don’t you agree. To all the persons, who unreserveedly justify the purchase of this jet. Your guilded cage is really a cardboard box, you need to come out of it and look at your society. It is ludicrous to compare Manning to a celebrity.The money celebrities spend belong to them, they worked hard for it, so they are entitled to do with it as they please. Manning is the leader of 1.3 million people, and that 400 million he wants to spend belongs to us, and as a democracy it must be spent in a manner which satisfies the needs of the majority. How can Minister Brown claim, there is nothing the government can do about high food prices, then try to spend 400 million on a jet that will benefit only an elite minority. Lok Jack argues that returning the airplane won’t bring hospital beds tomorrow, but for the people who have to sleep on the hospital floor, a 2 week or even 2 month wait is better than never. Have we forgetten the days when Eric Williams was boasting that money is no problem, only to be followed by recession. I am a political neutral, yet I think that a lot of the seemingly more exorbitant projects which the government has implemented such as the radar, the blimp,even the rapid rail, are justifiable because they aim to improve the life of all the citizens of T&T. The jet does not fall into this categeory (neither does the prime ministers residence) there is absolutely no justification for spending 400 million on a jet. If there was, Manning would have been preaching about it from the rooftops instead of trying to sneak it through the backdoor. The only benefit we have heard about this jet is that Manning will get to his meetings 2 or 3 hours earlier…Well Manning all you have to do is follow the example of citizens who have to crawl through traffic to and from Port-Of-Spain for work evry day, cater for 2 or 3 extra hours in your travel time. 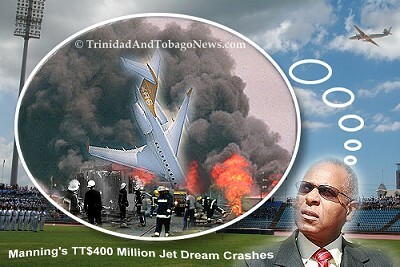 bombardier site say the jet cost 49.3M USD how come patrick plane costing 63M USD where the other 13M USD going?? so in other words, patrick fren arthur making 13m usd on the heads of tax payers, ah wonder who getting kick back and how much they getting? this country and those in power fail to realise that lavish living for them mean more ketch tail for the man on the street, a candle could boil a pot of water, if it heats it up long enough….people will only take so much before they explode….